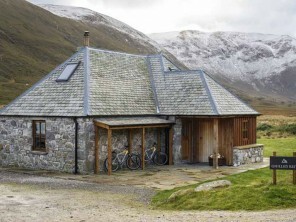 Deanich Lodge is tucked away deep in Alladale Wilderness Reserve, making it one of the most remote buildings in Scotland. It used to be a place where traveling sheep herders spent the night. 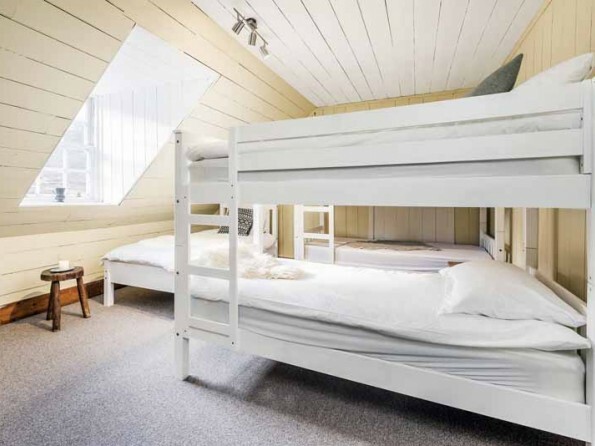 Today, it is a basic but beautiful bunkhouse, sleeping a maximum of 18 people. It’s the surroundings and off the grid experience that make this place so special: one look out of the window is enough to observe otherworldly beauty. ‘Deanich’ is the perfect base from where to experience true Highland wilderness: unwind and get lost in the great outdoors. 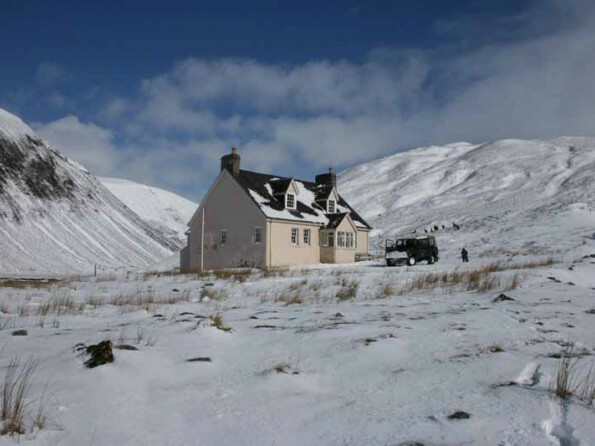 Deanich lodge is a unique, self-catered property in a stunning, remote location. Make sure you do all your shopping before embarking on your adventurous, bumpy journey to the lodge, or ask the Alladale team to supply the lodge with everything that is on your shopping list. This is the ideal accommodation for the adventurous traveller looking for a one-of-a-kind experience. Read a book by the fire, gaze out of the window with a steaming cup of coffee, and hike the hills to your heart’s desire. 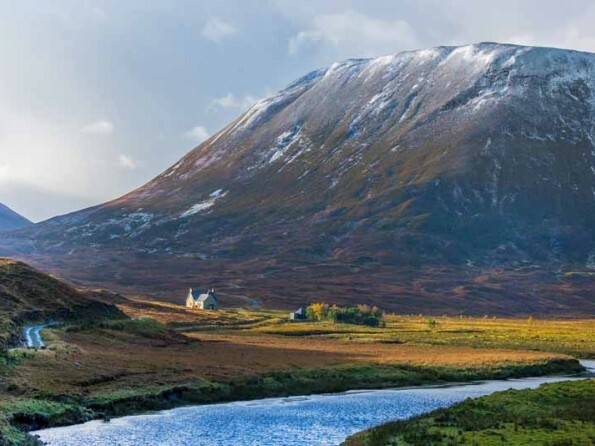 Alladale Wilderness Reserve’s 100 square kilometres of rugged mountains, forests, rivers and lochs are located in the heart of the Scottish Highlands. The Reserve enjoys its own micro-climate with above average rain-free days, which means you’ll likely be able to enjoy exploring this incredible place with a bit if sun on your skin. 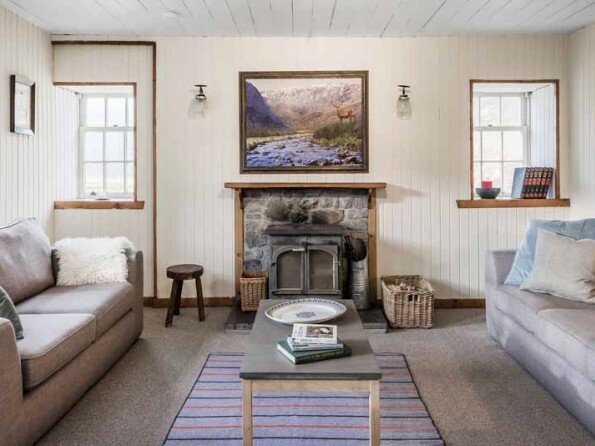 Deanich Lodge is extremely remote, which means activities are limited to hiking, swimming, and mountain-biking (the Reserve can provide mountain bikes on request, free of charge). 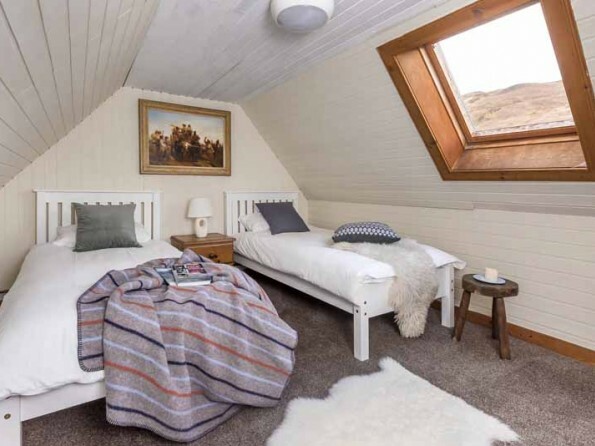 Whilst Alladale’s re-wilding project has been well publicised over the past decade, its different types of accommodation offer a variety of unparalleled experiences that allow guests to unwind and relax in a space more akin to your own home than a hotel. In addition to a multitude of activities available on the Reserve, the North of Scotland offers a host of incredible day trips; from exploring turquoise waters and golden beaches to historic castles and dolphin watching. The entrance to the reserve is situated only an hour and 30 minutes from Inverness. From Inverness, you take the A9 north (towards Thurso and Wick) over the Kessock bridge. Continue on the A9 until you pass the town of Tain. At the next roundabout, take the second exit onto the A836 (towards Ardgay ad Bonar Bridge), leaving the A9. In Ardgay, turn left onto the minor road by the Kyle of Sutherland Fisheries and after about a mile you will cross the River Carron, where you should follow the road to Croick Church. After a further 8 miles, turn left at the red telephone box and continue for 1.5 miles until you reach the cattle grid, then drive carefully for another 1.5 miles on the gravel track to the Alladale Lodge. 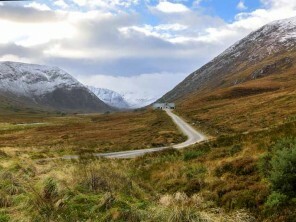 But the real adventure starts after meeting with the team at the Alladale Lodge, when you embark on another 7 mile, 45 minute drive to Deanich Lodge, along stunning Glen Mor and its ever changing river, past Highland cattle and big herds of deer. But if you think it can’t get any better, just wait until you’ve crossed the tiny bridge and catch sight of Deanich Lodge and the mountains surrounding it. Please be aware that Deanich lodge can only be reached by a 4x4 vehicle with high ground clearance. 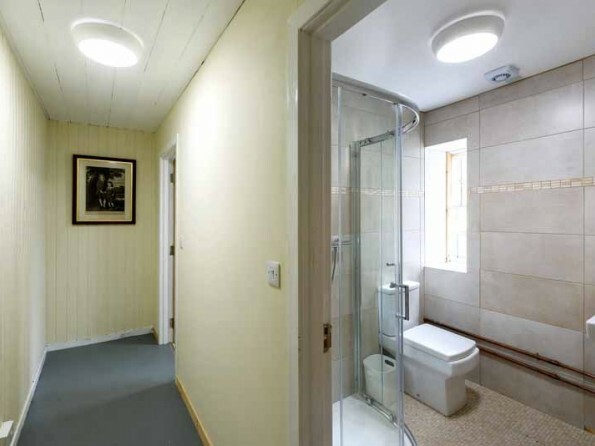 The lodge has 4 bunk rooms and 1 twin room, sleeping a maximum of 18 guests. 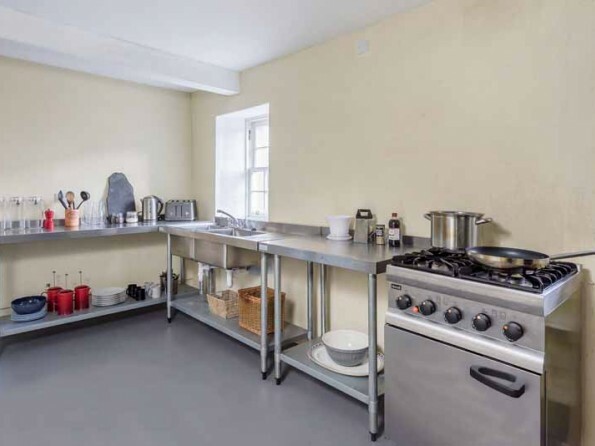 It comes with a basic, medium-sized kitchen that has all amenities you need to cook up 3 simple meals a day. 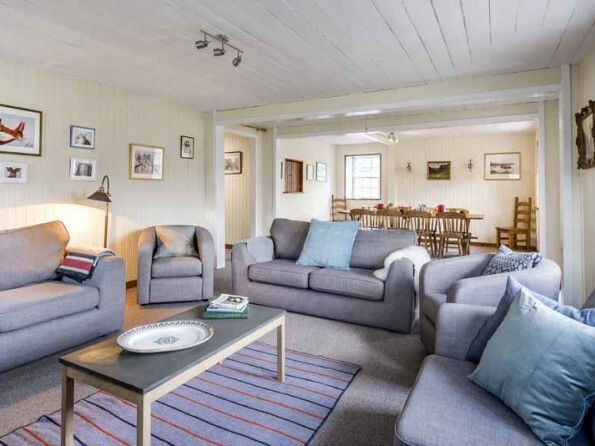 Deanich boasts a large living and dining area with windows all around, a cosy wood burner and enough blankets to snuggle up in when it gets nippy at night. A generator supplies the house with electricity, but don’t expect Wi-Fi or a phone signal out here in the wild. However, there is a satellite phone for emergencies. 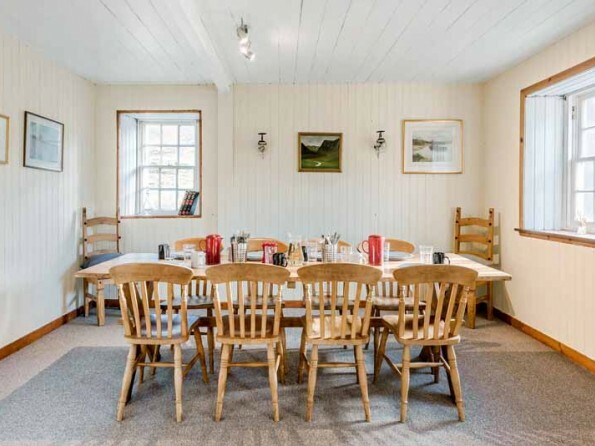 Situated at the mouth of Glen Mor, Deanich Lodge is basic but elegant. It merges gently into the landscape with its soft green exterior, overlooking majestic hilltops on all sides. Alladale Wilderness Reserve offers 3 types of accommodation on site, Deanich Lodge being the most basic and most remote of them all. 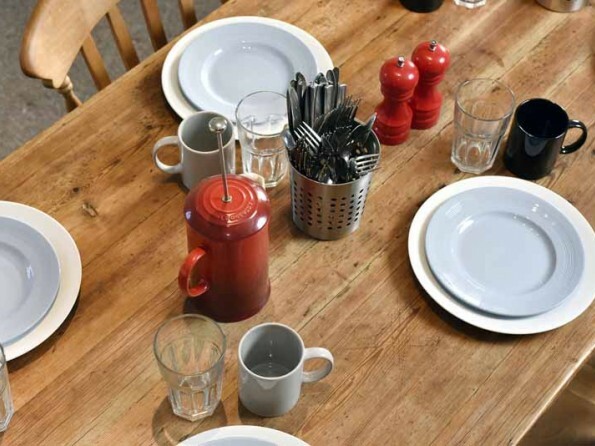 For a more comfortable and slightly better connected stay guests turn to the luxury Victorian Lodge or two comfortable (self)catered cottages. If you are coming as part of a larger group, you are welcome to book several accommodations to fit everyone. Please keep in mind that Deanich Lodge is located a 45-60 mins drive from the other accommodations. Minimum 7 night stay required. A 50% deposit is required at the time of booking and the outstanding balance is required 8 weeks prior to arrival date. Cancellation fees will apply, see the website for full details. Weeks run from Sunday to Sunday.